In Pega 7.2.1, multiple enhancements to the Event Strategy rule type improve the usability and functionality of event strategy design. A new graphical framework that improves the look and feel of the Event Strategy canvas and enhances the event strategy design experience. Support for splitting an event strategy stream into several paths. Implementation of distributed stream processing, which enables restoring the state of a data flow that contains the event strategy if a system failure or deactivation of that data flow occurs. You can configure instances of the event strategy rule in the Pega 7 Platform on a canvas-based modeler that you use to develop your business logic by using shapes and connectors. In Pega 7.2.1, the Event Strategy canvas introduces a new graphical framework with new Event Strategy shapes. In addition, enhanced navigation and management options provide an improved user experience for developing and maintaining event strategy rules. The Event Strategy shapes are modified. The canvas response time is improved. The new Lookup shape replaces the Static Data shape. By using this shape, you can add static data as input that is available for event processing in any place in an event strategy. You can now filter irrelevant events before invoking any static data. Split and Split and Join shapes have been added. By using these shapes, you can split event strategies into several paths to detect and process various types of events in a single event strategy rule. You can extend a Filter shape with OR conditions by clicking Add filter at the bottom of each Filter shape. This way, you create additional Filter shapes under the original Filter shape. The order of Filter shapes within a column has no effect on the processed results. A smart mini-map has been added. When you access an event strategy rule, if the strategy extends beyond the canvas viewport, the mini-map automatically expands in the bottom-right corner of the Event Strategy canvas. Otherwise, the mini-map is collapsed. You can add new strategy shapes by clicking a connector. The Plus icon on each connector indicates that you can add a new strategy shape. You can display the shape properties by clicking the Gear icon for the shape. You can split the stream in an event strategy rule into multiple paths. By splitting the stream into multiple paths, you can track different scopes of customer activity in one stream to detect meaningful trends in customer behavior. Split - You use this shape to add a (secondary, tertiary, and so on) event strategy path from anywhere in the primary path. The connector that radiates from the Split shape always leads to the Emit shape. The records from each path are emitted without being combined. To distinguish between different paths that lead to the Emit shape, the names of shapes that immediately precede the Emit shape in each path must be unique. Split and Join - You use the Split and Join dual shape to create a Split shape on the primary event strategy path and a Join shape next to it. With the Join shape, you can combine the data from various paths (based on the join condition that you specified) before the data is emitted. You can add shapes in between the Split and the Join shapes to the primary path. The Split shape does not have any properties and cannot be edited. For information about how the Join shape processes events, see: Split and Join logic in event strategies. You can recover the state of data flow work items that invoke an event strategy by using state management. 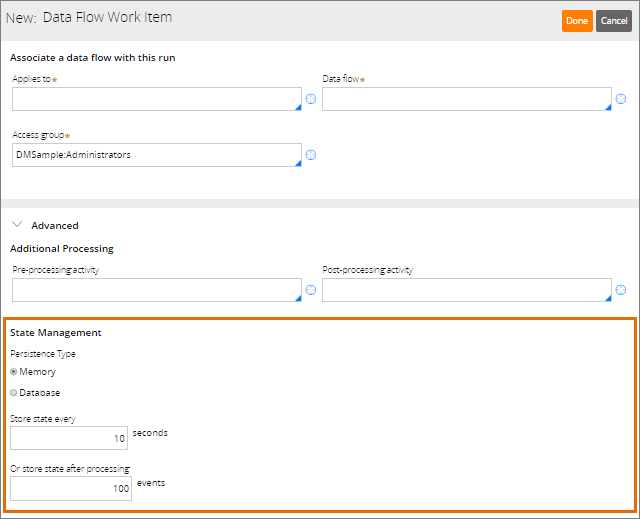 You can configure the state management settings on the Data Flow Work Item form for creating batch runs and real-time runs for data flows. Memory - In this mode, the data flow keeps the event strategy state in memory and writes the output to a destination when the data flow run finishes running. This mode provides for faster processing time, but in case of a system failure, all your in-memory data is lost. Database - In this mode, the state of an event strategy is stored in the Cassandra database in the decision data store by using the key-value store implementation. This mode ensures that you can recover from a crashed or paused data flow that runs an event strategy and resume processing events. The events that are captured while the data flow is inactive are processed when the data flow becomes active again. You can specify the frequency for storing the state of an event strategy as the elapsed time in seconds between consecutive store operations, You can also specify how many events to process before the event strategy is stored.